Two of Ibiza's biggest parties will put aside island politics next Thursday and join hands to host a special day/night event that will take place across Playa d'en Bossa's two most famous venues. 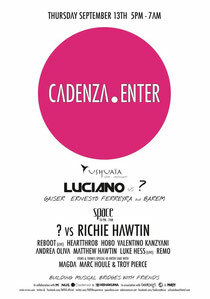 The historic collaboration between Cadenza's Luciano party at Ushuaia and M-nus' ENTER. party at Space will see DJs from both labels perform together at both venues. The party starts at 5pm in Ushuaia, and will finish at 7.30am in Space across the road. And in a move that is very unusual for the island, the one-off event will allow clubbers to attend both parties with one ticket. I like the helpful info you provide in your articles. I will bookmark your weblog and check again here frequently. I'm quite sure I'll learn lots of new stuff right here! Good luck for the next!